The Franklin S. Harris Fine Arts Center (HFAC) is named for former BYU president Franklin Stewart Harris. Born in Benjamin, Utah Territory, in 1884, he began his studies at BYU and finished with a doctorate in agronomy from Cornell University. In 1921, while teaching at Utah State University, Harris was offered the position of BYU president. He was thirty-six years old at the time. 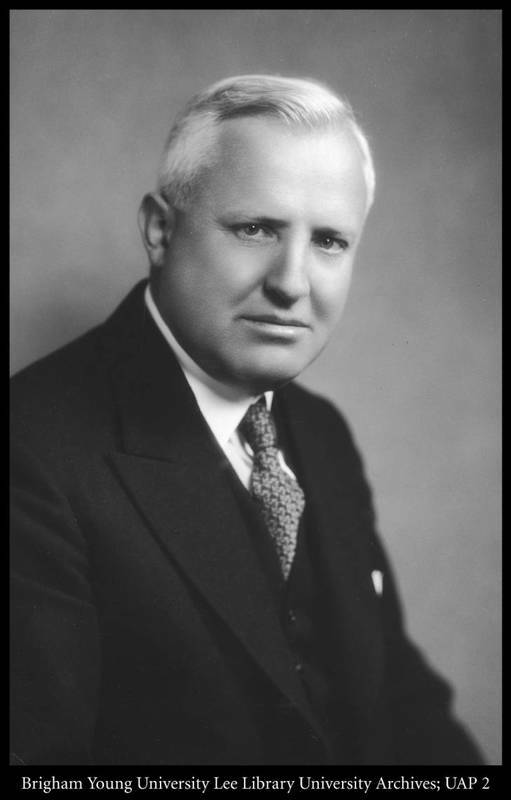 Franklin was president from July 1921 to June 1945—the longest administration in BYU history. His mission as president was to expand the school and its legacy. From the beginning to the end of his term, enrollment rose from 438 students to over 4,000. Franklin also helped establish BYU as an accredited four-year university. The list of his accomplishments also includes creating the College of Fine Arts with Garrit de Jong as its first dean. Harris believed art and music to be the center of a rich life. After years of dedicated service, Franklin S. Harris died on April 18, 1960. 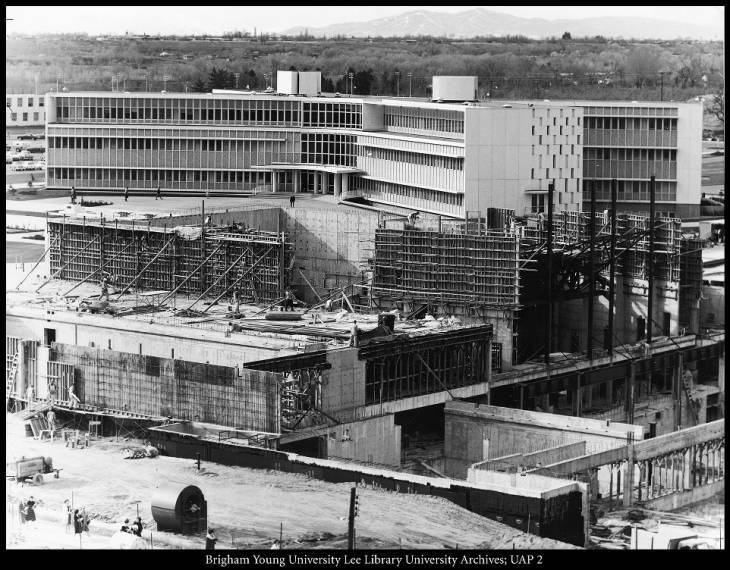 In October 1962, the BYU Board of Trustees announced that a new building would be built and named after the former BYU president. The president at the time, Ernest L. Wilkinson, attributed the growth of the arts at BYU to President Harris. Wilkinson said, “His administration was responsible for the acquirement of hundreds of important paintings and art objects . . . The distinguished position enjoyed by the University as a music center both for the study and enjoyment of music is largely the result of the support he gave to the fine arts.” Construction began on June 18, 1962, and the Harris Fine Arts Center was dedicated on April 3, 1965. The completion of the HFAC brought together the five departments of the College of Fine Arts and Communications: Arts, Communications, Dramatic Arts, Speech, and Music. The sixty-four classrooms, fifty-seven music practice rooms, five performance halls, TV production rooms, and main foyer (that was also a gallery where students could display their work) made the HFAC the largest academic building at the time. The unique letter and numbering system for classrooms also gained the HFAC the reputation of being the most confusing. In 2015, the Student Theatre Association used that reputation to institute a yearly “DisOrientation” to help new students find their way around the building and the academic options inside. In addition to traditional classes and performances, the HFAC hosts other colleges and events. On August 27, 1973, the Pardoe Drama Theatre held the first class of the J. Reuben Clark Law School. In 1974, the HFAC hosted the Mormon Arts Ball. The main foyer was transformed into a ballroom and the halls and theaters were full of performances: the Philharmonic Orchestra, the A Cappella Choir, violinists, pianists, and vocalists, one-act plays, readers theaters, and multi-media presentations. The HFAC also uses connections with the community to promote the arts. 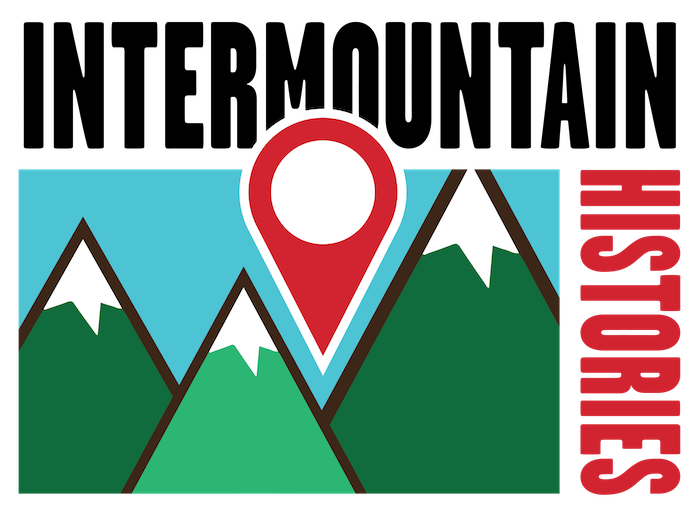 In 2005, the Provo City Library collaborated with BYU to start a program called ProvoReads. Children are encouraged to read and finish a book by being rewarded with two free tickets to a BYU performance of each year’s book, such as Sara, Plain and Tall and Holes. The HFAC also helped the Food and Care Coalition with a unique fundraising idea in 2007. Art students were encouraged to make a piece to be put in a vending machine in the HFAC to be sold for the price already in the machine. The project helped art students work with a focus on service and helped the community interact with art in a new way while raising money for a local charity. The HFAC student community often exhibits art work on the foyer halls, but music students also use the area to show off their hard work. On Fridays at 12:00 p.m., anyone passing through the HFAC can listen to the Concerts at Noon. In 2012, the program was started to give performance majors a chance to present their pieces in a low pressure environment before taking to the stage. Students gather to hear the music and support their classmates every Friday, except on holidays and during finals. Every December, the Concert at Noon is turned into a Christmas sing-along. The HFAC now houses the School of Music, the Department of Theatre and Media Arts, Department of Art, Department of Design, the Dean’s office, Arts Production, and the CFAC Advisement Center. With over three hundred performances a year, the HFAC continues to honor Harris and create a center to enrich the lives of students and the community. Franklin S. Harris, ca. 1945 ~ Source: From the L. Tom Perry Special Collections, Brigham Young University. “Franklin S. Harris, ca. 1945,” available at https://contentdm.lib.byu.edu/digital/collection/BYUPhotos/id/303/rec/6. 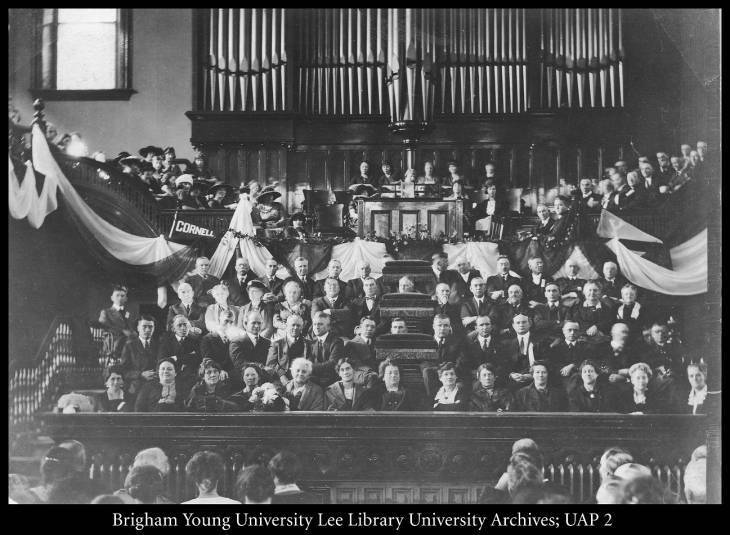 Inauguration ceremonies for Franklin S. Harris, October 17, 1921: Inauguration ceremonies for President Franklin S. Harris were held in the Provo Tabernacle. Many General Authorities of the Church were on the stand as well as the outgoing president, George H. Brimhall. On the left was a pennant from Cornell, where Dr. Harris had received the Ph.D. degree, and on the right a Y pennant. 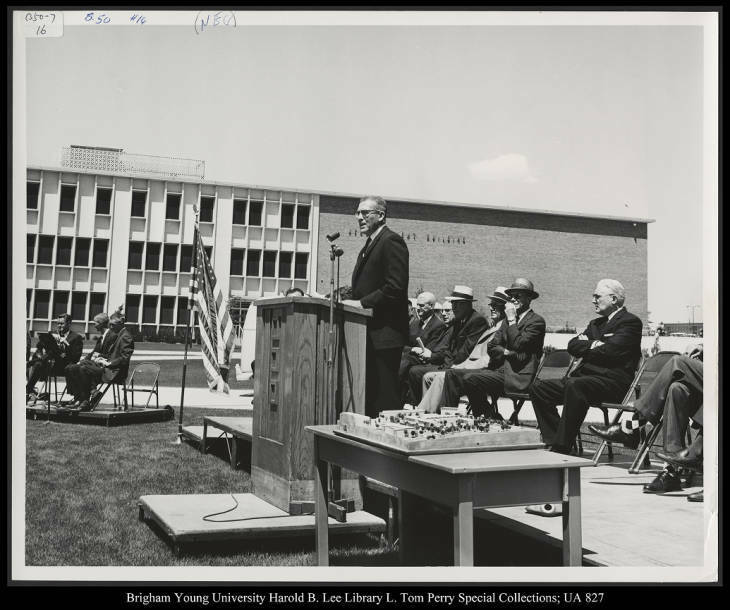 He was the first BYU president ever to enter office with a Ph.D. degree and in his inaugural address expressed his intention of making BYU "The Great Church University." ~ Source: Wakefield, Lynn, from the L. Tom Perry Special Collections, Brigham Young University. “Inauguration ceremonies for Franklin S. Harris, October 17, 1921,” available at https://contentdm.lib.byu.edu/digital/collection/BYUPhotos/id/302/rec/5. 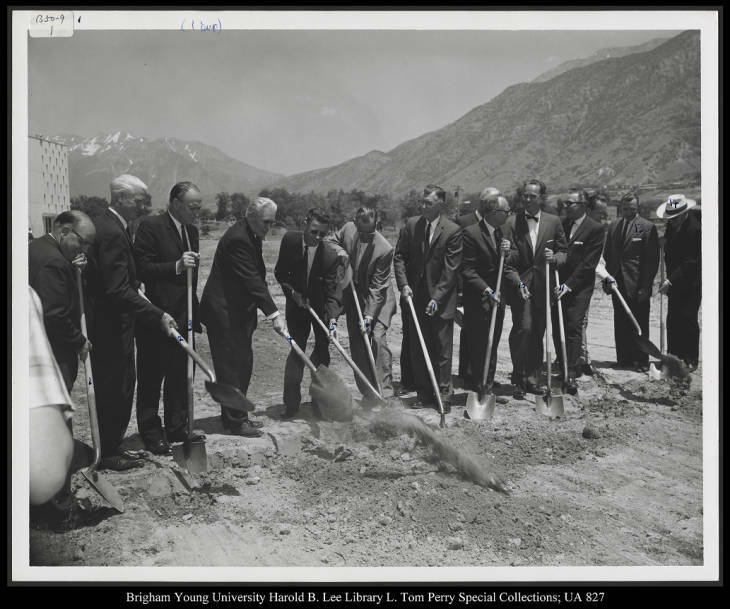 Image 12: Groundbreaking ceremonies with Hugh B. Brown. ~ Source: From the L. Tom Perry Special Collections, Brigham Young University. “Brigham Young University photographs of the Franklin S. Harris Fine Arts Center Image 12,” available at https://contentdm.lib.byu.edu/digital/collection/SCMisc/id/76987/rec/4. Image 1: From left to right: Alma Burton, Win E. Berrett, Gerrit de Jong, Elder Hugh B. Brown, Howard Brown, Alfred Brown, Vice President Earl C. Crockett, Dean Conan Mathews, Vice President Ben Lewis, Harold Hanson, Crawford Gates, Morris Clinger, Harold R. Clark. ~ Source: L. From the L. Tom Perry Special Collections, Brigham Young University. 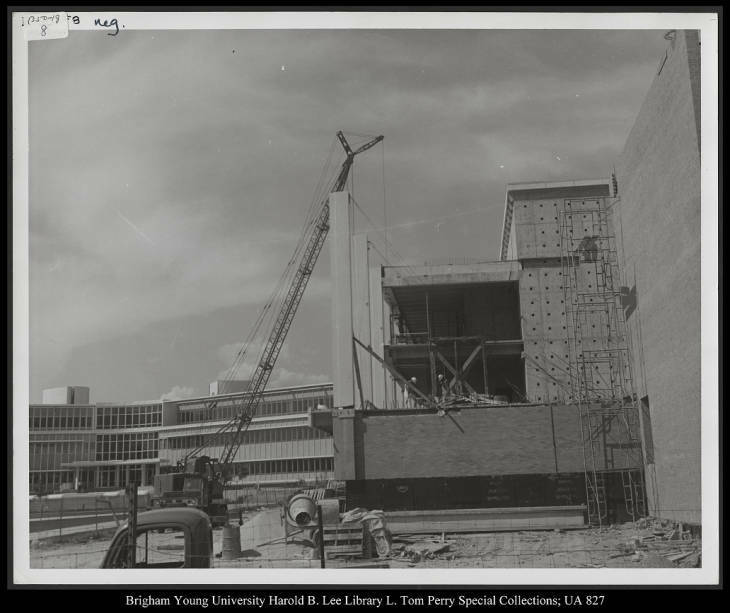 “Brigham Young University photographs of the Franklin S. Harris Fine Arts Center Image 1,” available at https://contentdm.lib.byu.edu/digital/collection/SCMisc/id/76962/rec/4. Image 7: Harris Fine Arts Center photographed April 1977 by Physical Plant ~ Source: From the L. Tom Perry Special Collections, Brigham Young University. 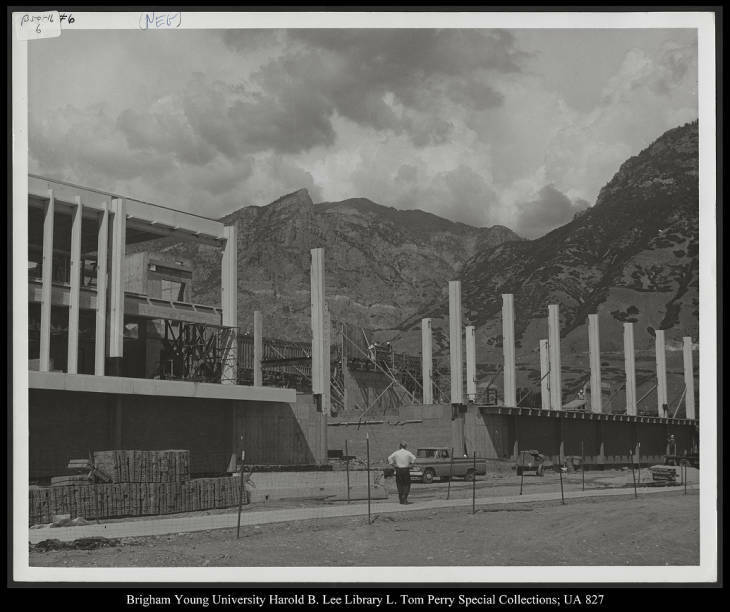 “Brigham Young University photographs of the Franklin S. Harris Fine Arts Center Image 7,” available at https://contentdm.lib.byu.edu/digital/collection/SCMisc/id/76998/rec/4. The Harris Fine Arts Center under construction, ca. 1963 ~ Source: From the L. Tom Perry Special Collections, Brigham Young University. “The Harris Fine Arts Center under construction, ca. 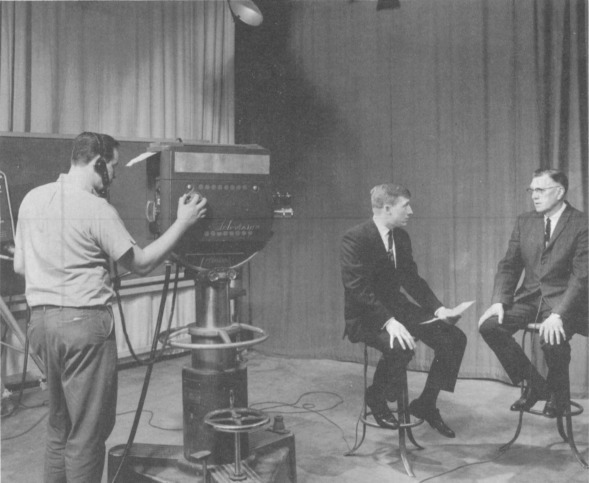 1963,” available at https://contentdm.lib.byu.edu/digital/collection/BYUPhotos/id/730/rec/4. Image 11 ~ Source: From the L. Tom Perry Special Collections, Brigham Young University. “Brigham Young University photographs of the Franklin S. Harris Fine Arts Center Image 11,” available at https://contentdm.lib.byu.edu/digital/collection/SCMisc/id/76972/rec/4. Image 13 ~ Source: From the L. Tom Perry Special Collections, Brigham Young University. 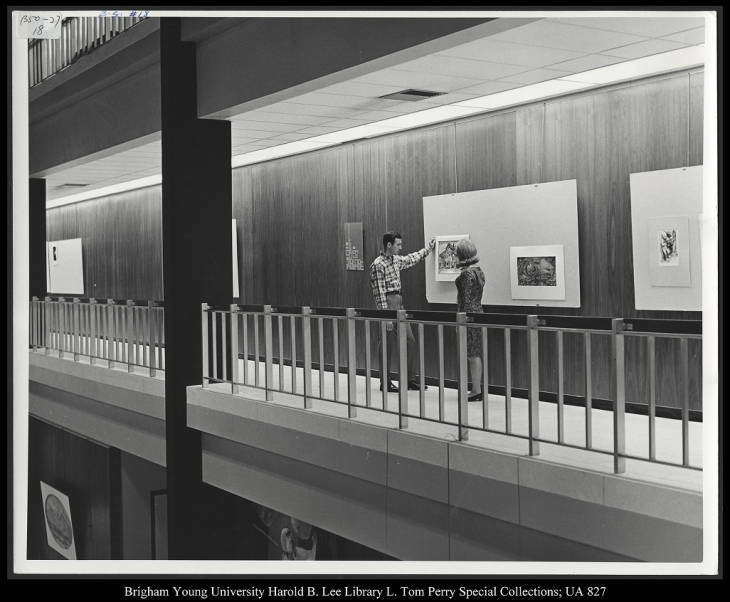 “Brigham Young University photographs of the Franklin S. Harris Fine Arts Center Image 13,” available at https://contentdm.lib.byu.edu/digital/collection/SCMisc/id/76974/rec/4. Guests on Stage During the Naming Ceremonies of Various Areas in the Harris Fine Arts Center, November 23, 1965: Honored guests were on the stage of the Concert Hall in the Harris Fine Arts Center at services on November 23, 1965, when areas of the building were named for them or their families. (The list of names is available at source link.) ~ Source: From the L. Tom Perry Special Collections, Brigham Young University. 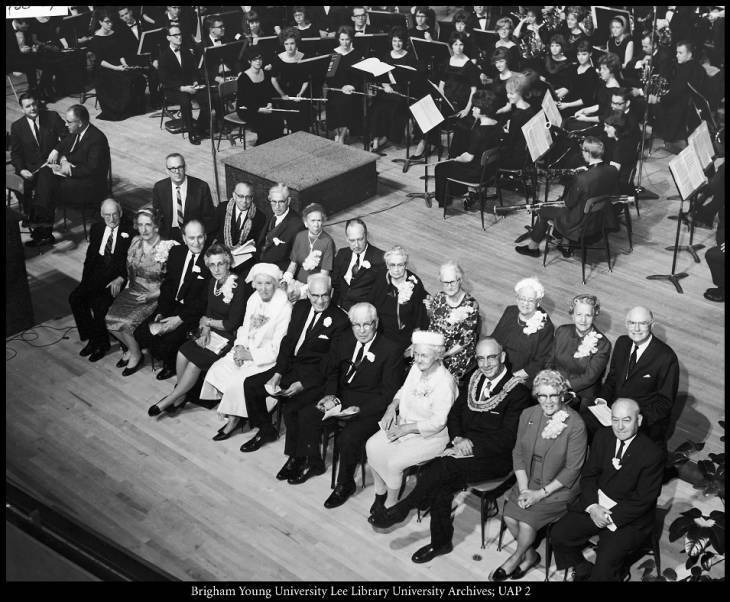 “Guests on stage during the naming ceremonies of various areas in the Harris Fine Arts Center, November 23, 1965,” available at https://contentdm.lib.byu.edu/digital/collection/BYUPhotos/id/735/rec/6. The Franklin S. Harris Fine Arts Center, April 3, 1965 ~ Source: Brigham Young University News Bureau, from the L. Tom Perry Special Collections, Brigham Young University. 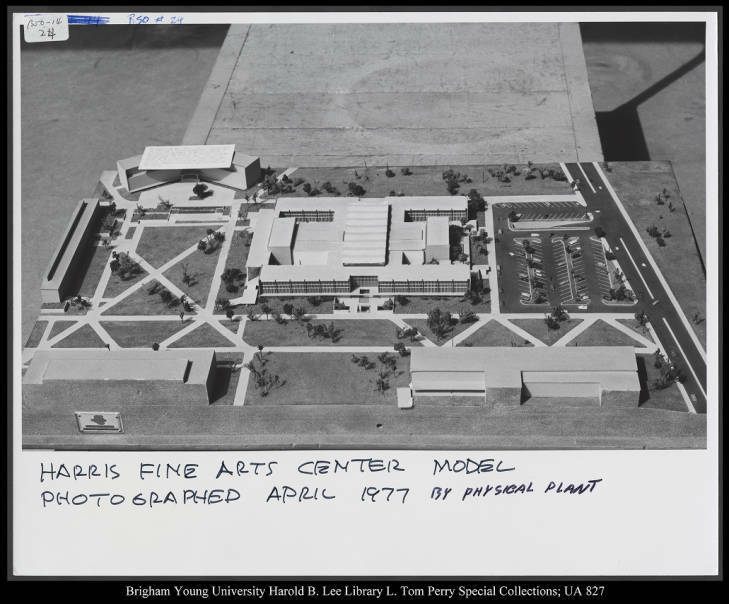 “The Franklin S. Harris Fine Arts Center, April 3, 1965,” available at https://contentdm.lib.byu.edu/digital/collection/BYUPhotos/id/733/rec/1. Image 1 ~ Source: From the L. Tom Perry Special Collections, Brigham Young University. 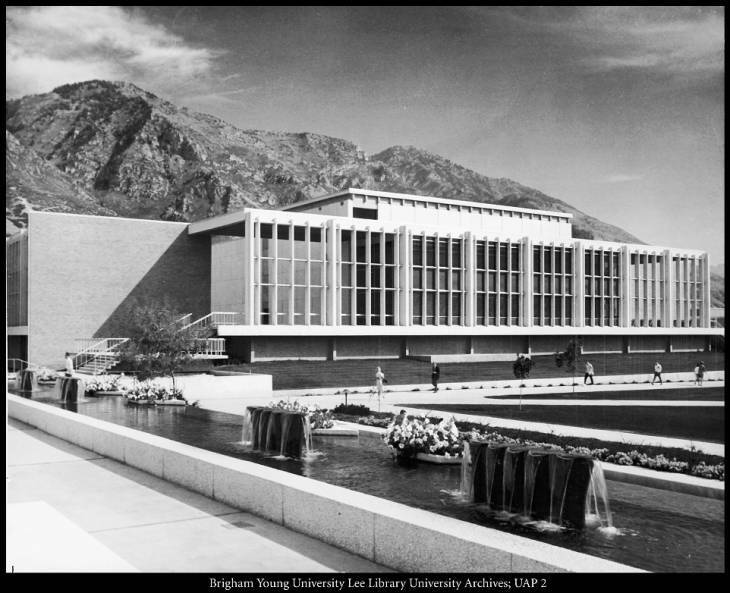 “Brigham Young University photographs of the Franklin S. Harris Fine Arts Center Image 1,” available at https://contentdm.lib.byu.edu/digital/collection/SCMisc/id/76976/rec/4. Image 6 ~ Source: From the L. Tom Perry Special Collections, Brigham Young University. 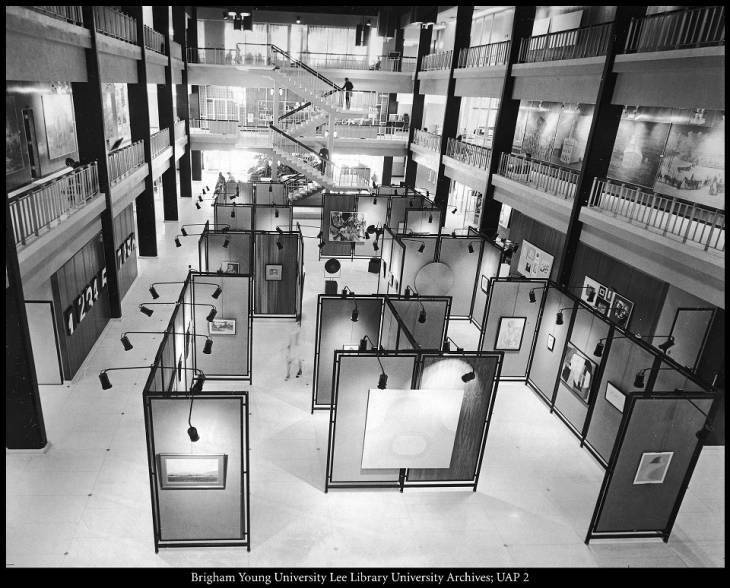 “Brigham Young University photographs of the Franklin S. Harris Fine Arts Center Image 6,” available at https://contentdm.lib.byu.edu/digital/collection/SCMisc/id/76997/rec/4. Image 15 ~ Source: From the L. Tom Perry Special Collections, Brigham Young University. “Brigham Young University photographs of the Franklin S. Harris Fine Arts Center Image 15,” available at https://contentdm.lib.byu.edu/digital/collection/SCMisc/id/76990/rec/4. Image 4 ~ Source: From the L. Tom Perry Special Collections, Brigham Young University. 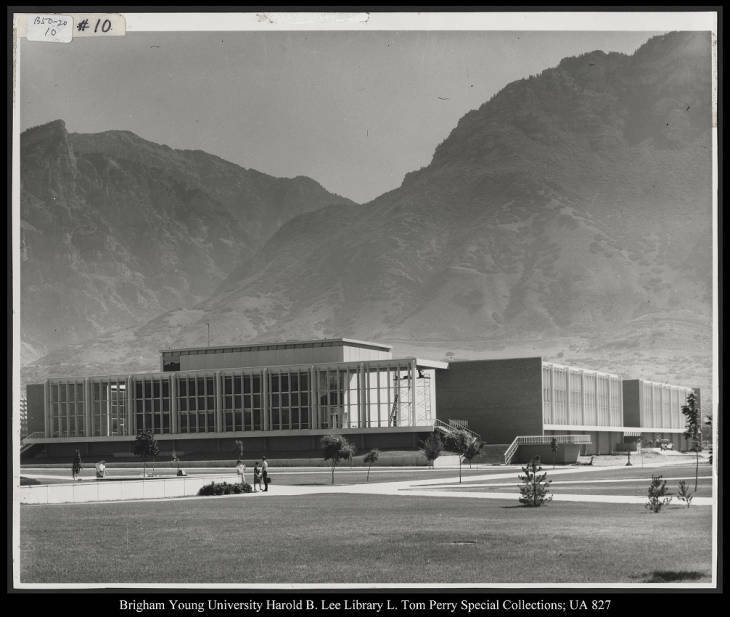 “Brigham Young University photographs of the Franklin S. Harris Fine Arts Center,” available at https://contentdm.lib.byu.edu/digital/collection/SCMisc/id/76979/rec/4. 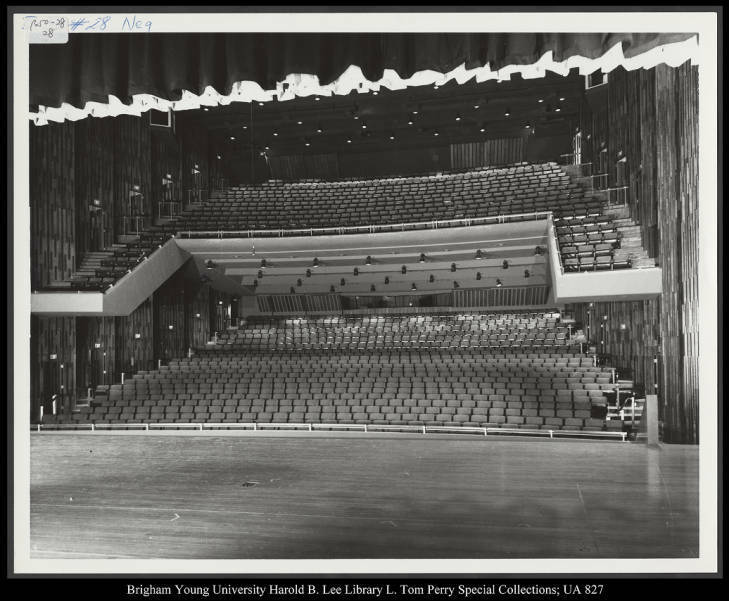 Gerrit D. Jong Concert Hall ~ Source: From the L. Tom Perry Special Collections, Brigham Young University. “Brigham Young University photographs of the Franklin S. Harris Fine Arts Center Image 9,” available at https://contentdm.lib.byu.edu/digital/collection/SCMisc/id/77000/rec/4. The Central Gallery of the Harris Fine Arts Center, ca. 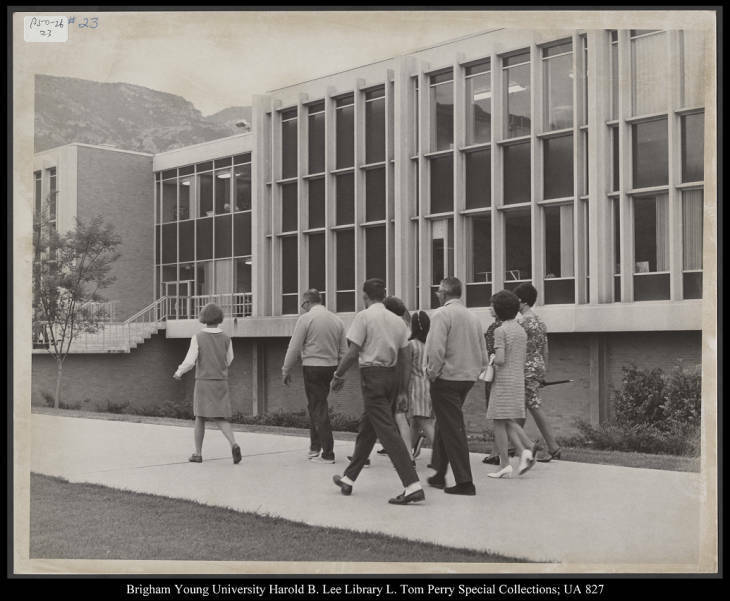 1965 ~ Source: From the L. Tom Perry Special Collections, Brigham Young University. “The central gallery of the Harris Fine Arts Center, ca. 1965,” available at https://contentdm.lib.byu.edu/digital/collection/BYUPhotos/id/734/rec/1. New T.V. Facilities: New T.V. Facilities Have Given Added Impetus to Growing Communications Dept. ~ Source: Garrison, LaVerda. Daily Universe. “Finally Under One Roof,” April 2, 1965. Available at http://history.cfac.byu.edu/images/e/eb/DU_2_April_1965.pdf. The Mormon Arts Ball in the Harris Fine Arts Center, 1974: A symphony orchestra provided the music for the 1974 Mormon Arts Ball in the colorfully decorated grand gallery of the Harris Fine Arts Center. Before the dancing, a program featured concert violinists, pianists, and vocalists as well as the Philharmonic Orchestra and A Cappella Choir. Throughout the evening Mormon artists performed one-act plays, concert recitals, readers theaters, and multi-media presentations in the various halls and theaters throughout the building. ~ Source: From the L. Tom Perry Special Collections, Brigham Young University. 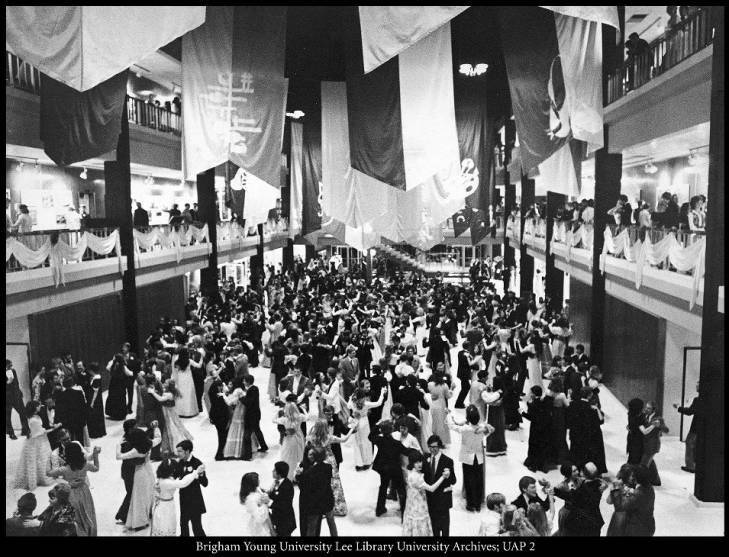 “The Mormon Arts Ball in the Harris Fine Arts Center, 1974,” available at https://contentdm.lib.byu.edu/digital/collection/BYUPhotos/id/960/rec/1. The First Class of the Law School was Taught in the Pardoe Drama Theatre of the Harris Fine Arts Center, August 27, 1973: This was the scene at the first class of the Law School on August 27, 1973, which was taught in the Pardoe Drama Theatre of the Harris Fine Arts Center, marking the formal opening of the school. The speakers were President Marion G. Romney, second counselor in the First Presidency of the Church, and BYU President Dallin H. Oaks. ~ Source: From the L. Tom Perry Special Collections, Brigham Young University. 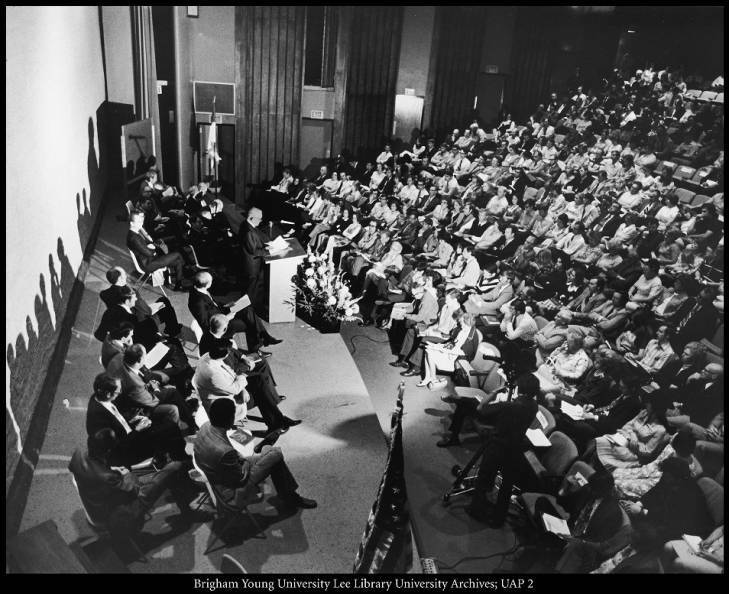 “The first class of the Law School was taught in the Pardoe Drama Theatre of the Harris Fine Arts Center, August 27, 1973,” available at https://contentdm.lib.byu.edu/digital/collection/BYUPhotos/id/912/rec/7. Bowman, Elizabeth. The Daily Universe. “Library Starts Children’s Reading Program for BYU’s Theatre Performance,” June 2, 2006. Available at http://universe.byu.edu/2006/06/02/library-starts-childrens-reading-program-for-byus-theater-performance/. 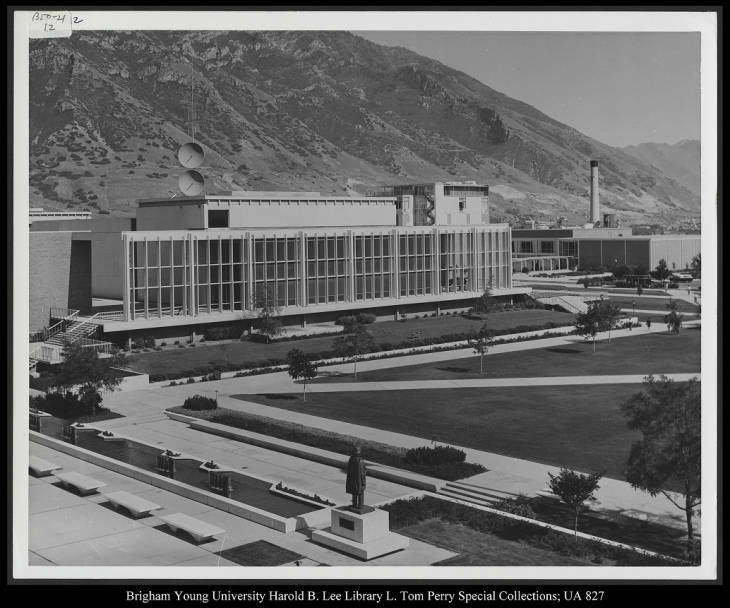 Emily Cook, Brigham Young University, “The Harris Fine Arts Center,” Intermountain Histories, accessed April 19, 2019, https://www.intermountainhistories.org/items/show/194.